How do you get a rhino to fly? How do you get a 1.5-tonne rhino on an aeroplane? It sounds like a Christmas cracker joke, or the start of a Hollywood film pitch. But the man who knows the answer is Les Carlisle, project manager of the conservation group Rhinos Without Borders. Under his guidance, 12 white rhinos have just left their native South Africa for a new life in a nearby country, as part of an anti-poaching project. The beasts spent 15 hours in a truck, plane, and helicopter to get from a game park in KwaZulu Natal, on South Africa's east coast, to their new location [which the BBC won't name for their protection]. "We send them an email with a boarding pass and a seat number, and then we run like hell," Mr Carlisle chuckles. But in some ways, the truth is stranger still. "A massive translocation like this involves having the right equipment and the right people in place to be able to manage these very big animals," the project manager says. "The animals are caught and put into a steel crate that's specially designed to contain them, and designed to fit in the aircraft." Mr Carlisle says it's not a matter of simply knocking them out. "You have to immobilise them - make them go to sleep completely, and then blindfold them. And then you put earplugs in their ears. "And then, you slowly give them a little bit of [sedative] reversal, enough so they can stand up. They're unco-ordinated at that stage - so then you put a rope round their heads and you pull them slowly into the crate. "They have to walk on their own feet because they're very heavy. You can't move a tonne of sleeping meat!" The rhinos need to be awake throughout the flight so they can move their legs and regulate their own breathing. "The problem with a flight that long and an animal this big, is that if it lies for too long, that restricts circulation to the leg. And they get pins and needles - and then occasionally the animal could lose the use of that leg," the conservationist says. Then comes the heavy lifting. With the rhinos safely in their transport crates, a crane lifts them onto the back of a truck bound for the airport. Next, the crane deposits them on a loading vehicle, which will move them on to a plane. "In this case we had rollers on the floor," Mr Carlisle says. "We just laid them onto the rollers, and then rolled them into the aircraft. 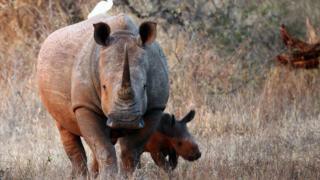 Rhino slaughter: How bad is the problem? The process involves a significant team of human helpers. "The loading - you've normally got between 10 or 12 people per rhino. And we normally do two at a time, so 25 people." Sadly, the move requires an armed security contingent due to the threat from poachers. Trading in rhino horn has been banned globally for four decades, but the substance - traditionally used in Chinese medicine - has a higher black market value than gold or cocaine. Mr Carlisle says there are four rhinos airborne at any one time, "in a big military transport plane". For the 12 re-homed animals, the flight time was about two hours and 40 minutes. After clearing customs with their endangered species - and some serious paperwork - the team encountered an unexpected glitch. Water levels at the rhinos' proposed habitat were too high, with floods a real risk. "We had to heli-sling them to their new home. They've had two flights. It's a hell of an operation!" laughs the project manager. Step 4: Happily ever after...? Most of the world's wild rhino population - between 20,000 and 25,000 individuals - live in South Africa, where poaching is rife. Rhinos Without Borders ultimately wants to resettle 100 of them. The cost of shifting just one animal is around $45,000, if you include the expense of monitoring teams and anti-poaching patrols. But as over 1,000 a year are killed in South Africa, equivalent to one every 7.5 hours - it may be the price of avoiding extinction. Although Mr Carlisle is a veteran of animal relocation projects, he says this one has been special. "I've translocated 40,000 [creatures] to about 70 new destinations in my career, and this has probably been one of the most emotive. "It's absolutely unbelievable to see these animals slowly get up, take a few steps ... It really was emotional - phenomenal!" Each of the roving rhinos had an ankle tag fitted and an ID chip implanted while under sedation, so monitoring teams can keep tabs on their welfare. With any luck, they'll be too busy grazing - and breeding - in their new home to even notice.